Every year, I am more and more amazed with the different pumpkin recipes people come up with. Just when you think you've seen them all, you discover a few new ones. I found these cookies the other day over at The Stirring Place and made them the very next day. I had saved a recipe for pumpkin snickerdoodles a month or so ago and had been dying to try them, but then I found this recipe and you all know I am a sucker for any type of frosting/filling, so I decided to make these first! I had to make some cookies for a party our friends had the other day and I had leftover cream cheese frosting. So, instead of using Faith's recipe for pumpkin cream cheese, I just spiced up my cream cheese frosting! These turned out DELICIOUS! 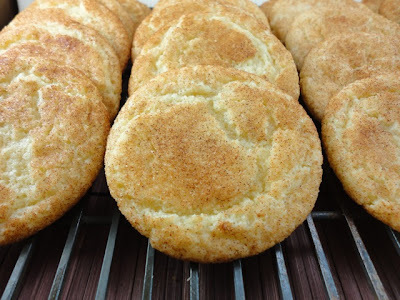 I think they would be a huge hit with any snickerdoodle or pumpkin lover! 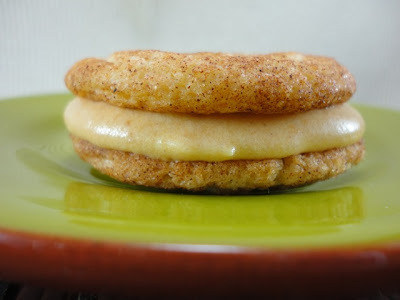 If you're not a cookie sandwich person, you could always serve the pumpkin cream filling as a dip for the snickerdoodles or graham crackers or apples? Or anything sweet! Preheat oven to 400 degrees. Cream together the butter and sugar until light and fluffy. Add the eggs and vanilla. Combine the flour, cream of tartar, baking soda and salt and add to creamed mixture. Chill dough for at least 30 minutes. Roll into balls about the size of a large marble and roll in cinnamon and sugar mixture. Bake 8-10 minutes. I used leftover cream cheese frosting that was made from butter, cream cheese, powdered sugar and vanilla. I added to that a little brown sugar (not too much, because it is already pretty sweet), a little pumpkin pie spice and a few tablespoons of canned pumpkin. I tasted and adjusted ingredients until it was delicious! Jenn's Notes: I cut the cookie recipe in half and got 34 medium sized cookies. I baked mine for 9 minutes. I left some plain and I made the others into sandwiches. The ones that I left plain were a little tuff the next day, but the ones with the cream filling were soft and chewy! The filling must keep them soft. The pumpkin filling is pretty soft when it is at room temperature and squooshes out the sides when you take a bite of the sandwich. If that bothers you, you would probably just want to spread the filling on the top of one cookie or use the filling as a dip. Either way, snickerdoodles and pumpkin are a perfect pair! Do you have any idea how much I'm craving a something sweet right now? My mouth is watering, this looks so yummy. Thanks so much for posting my cookies! Sometimes I feel like I'm just writing to myself and I forget people read it. Haha. But it was so great to read your comment and then come over here and see your awesome blog. I love your adaptations and suggestions. Fabulous idea to use the cream filling as a dip. I dip these snickerdooles into your filling before I'd every think to dip them in anything else. Both the cookies and the dip look fabulous. I love snickerdoodles, and turning them into cookie sandwiches is just brilliant! OK! First I am a DIE HARD SNICKERDOODLE FAN! Second, on my scroll down here to tell you that and that I'm totally bookmarking this recipe to try it, I can see all that DELICIOUSNESS over there just to the left and now I HAVE to follow you! YUM!!! Holy CRAP these look good!? I'm going to share this on my crafty facebook page. Yum-O! These look SO yummy! 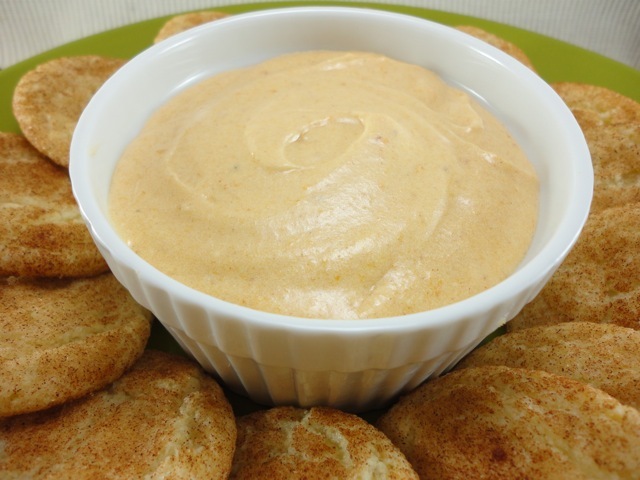 I love anything pumpkin and combined with the snickerdoodles, I'm sure these are amazing! :) Thanks so much for linking up! Have a wonderful day!